‘Wierd’ science, originally uploaded by Alan Perryman. 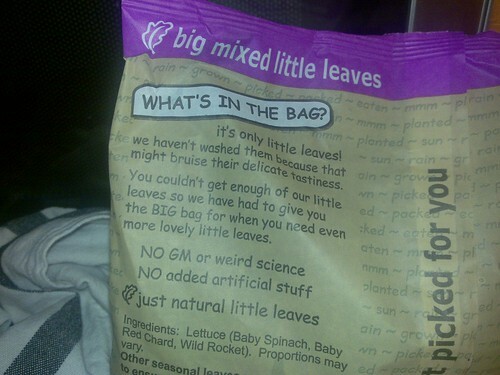 So I take it none of the leaves were selectively bred for particular characteristics then? I don’t get what it is that makes marketing people so scared of science… (I’m not even going to rant about the comic sans clone). Please don’t lecture at me via food packets. If I really want to weigh up the pros and cons of genetic engineering, I’ll find a friendly biochemist to ask. I just want to make at sandwich for tomorrow’s lunch. Ok?